I LOVE shoes... i always have since i was small, I remember trying my Mum's on and squeezing my younger sisters on. I have never really grown out of loving shoes. When I saw the blog competition at A daisy chain dream I new I had to share my love of shoes with you. So whats my favourite pair of shoes? Hmmmm this is such I hard question! I have a favourite everyday pair, flats, boots, heels, wedge and flipflop! 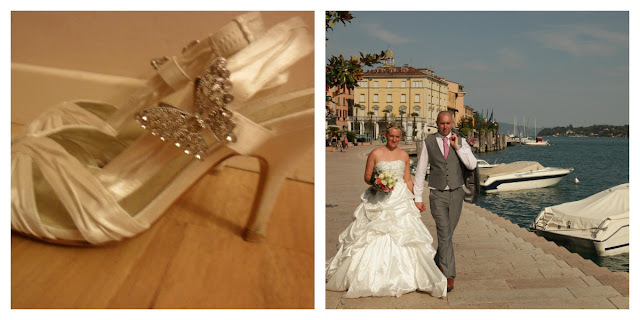 So I will share these, these are my wedding shoes, I love them I will keep them forever, I might never wear them again I don't know, but when I look at them, I remember the happy day I wore them strolling along the Italian Lake Garda hand in hand with my new husband, with our children and family laughing along side us, the heat, the colours, the sun, the food and pure happiness. Being a beautician I wear flats all day for work, so I need the comfort and the style and these Davina Bow Ballerinas definitely seem to have both. I also have quite a wide foot so these would be perfect. These black biker mid heel boots would but perfect for walks with the kids and keeping my feet warm, not to mention they are super stylish! These just because anyone needs a bit of rock chic glamour in their life, no? YES! And they kind of look sensible enough for the school run, don't they?? Any way Lipsy stud wedge shoe boots are definitely on my wishlist. I love the fact that next do other brands. These... sensible, practical and darn right cool! Tan casual wedge boots I have to say I'm a fan, I have a pair like these in black and they are my favourite everyday shoe! So these would be my replacements for my old shoes, what do you think? Do you have a shoe passion? Oooo shoe cakes that's a great idea! I still have my wedding shoes too - I could never part with them - I loaned them to my sister for her wedding too I think it's nice to keep things with such sentimental value.